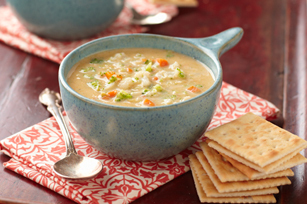 The creamy rich consistency of this simple-to-prepare soup will amaze you. Bring vegetables, water and broth to boil in large covered saucepan; simmer on low heat 10 min. or until vegetables are tender. Stir in Cheez Whiz; cook 1 min. or until Cheez Whiz is melted and soup is heated through, stirring frequently. For a smooth consistency, use blender or food processor to blend soup until smooth. Or, puree directly in the saucepan with a hand or immersion blender.